Competitive swimming is compatible with a wide variety of body types. There are, however, certain characteristics of a swimmer’s body that are common to most athletes in the sport. How different muscle groups over or under-develop in response to swimming can have a dramatic impact on how well the athlete moves on land. This article defines the five most common idiosyncrasies aquatic athletes face. To learn how to prepare for championship swimming season check out this article. Swimmers are notorious for having broad shoulders and a rounded posture. The muscles in the shoulder and upper back are hypertrophied from repetitive motion. This additional muscle mass contributes to excessive curvature in the spine and a weak core exposes the lower back to more strain. Poor posture can cause a number of problems. A slumped posture, also known as kyphosis, places strain on discs in the spine. If this posture becomes chronic, structural changes can occur and lead to reduced range of motion and difficulty breathing. Moreover, the hyper-curvature of the spine and tightness in the shoulders can cause pain in both regions as well as referred pain in seemingly unrelated areas. Overall, poor posture can cause chronic pain and put the athlete at risk of acute spinal disc injuries during swimming dryland training. Many swimmers naturally exhibit hyperextension in their joints. Hyperextension means the joint rotates beyond the normal angle, allowing the limb to extend past a straight line. Elbow hyperextension results in the arm bending past straight and knee hyperextension results in the knee bowing further backward. This enables swimmers to get a bigger catch with each stroke and to kick a greater volume of water with each kick. This is great for swimmers in the pool, but athletes must be careful when performing exercises during swimming dryland training. Swimmers are extremely quadricep dominant in lower body movements. Kicking, pushing off the wall, and diving all build strength in quadriceps. Muscle groups operate in a system called co-contraction. When one muscle concentrically contracts (shortens in length) its opposing muscle eccentrically contracts (lengthens while contracted). For example, on the “up kick” of a dolphin kick, the quadriceps concentrically contract to bring the leg into extension while the hamstring, the opposing muscle, eccentrically contracts as the leg swings forward. Co-contraction is a good thing, and it stabilizes movements in the pool and on land. Qaudricep dominance becomes harmful when a swimmer's muscle memory signals their quadriceps to activate first and foremost. When the brain adapts to signaling one muscle group preferentially, the surrounding muscle groups can lose the ability to activate when they are supposed to. This may not be apparent in the pool, but it can be detrimental during swimming dryland training. In the pool, swimmers never have to deal with absorbing shock. However, when athletes train on land, gravity can wreak havoc on a swimmer’s joints. With so much time in the pool, swimmers can have slightly lower bone density than land-based athletes. The main issue is that swimmers generally do not properly absorb the shock sent up the legs when running or landing from a jump. During a landing, athletes exert a force on the ground and the ground exerts an equal and opposite force on athletes. Athletes that spend time on land develop musculature and will be able to distribute that force evenly throughout their body such that no particular joint or muscle bears the brunt of the energy absorbed. Swimmers, however, may divert the force randomly or in an unbalanced way. The full force can be sent to the hip joint, the knees, ankles, or perhaps one side of the body more than the other and cause acute and chronic injuries. Moreover, running and other high-impact dryland activities negatively affect swimmers. Every day, swimmers kick their feet back and forth, perhaps thousands of times in one practice. This repetitive motion makes the tendons and ligaments in the foot and ankle extremely flexible, giving swimmers a great range of motion in kicking. On land, loose ankles can be a problem. Uneven surfaces and landing from jumps can result in sprained ankles. There are a variety of exercises that can be implemented in swimming dryland training that can help strengthen ankles. Repetitive swimming movements cause swimmers to develop distinctive features that can are helpful in the water, but consequential on land. Athletes should combat these negative effects with specific swimming dyland training. 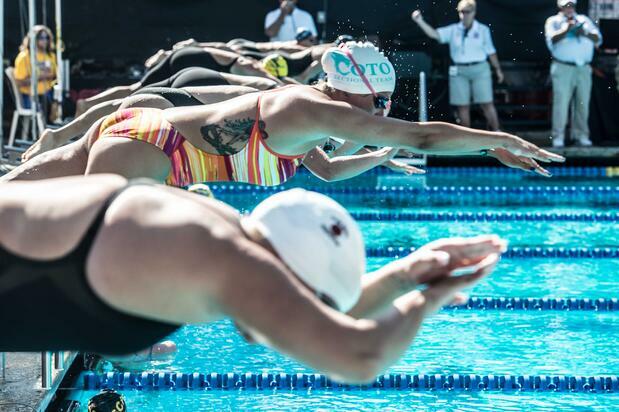 Click here to check out dryland training for a swimmer's body.